Its been a while since the last Trackgang news. Thanks to the guys that have given some feedback on what they've been up to. I believe that there is some good activity happening with NZR modeling in the BoP based on a bit of talk in the air. Main activity recently has been attendance to two exhibitions during the school holidays by Kevin Cherry's layout ably assisted by Alan Davidson. The usual 'Mr. Murphy' had a hand to play on both occasions as expected when operating in the public eye, but the layout was well appreciated and numerously photographed. A Hamilton both the 9mill Jaffas as well as the Hamilton NZRers were interested in the goings on. In Rotorua both Pete and Brett are continuing to make progress on each of their respective projects. Pete has set up some 9 mill track work on his modules. Brett continues to make progress from Ngongotaha to Turakenga on his layout, producing some fine buildings along the way. 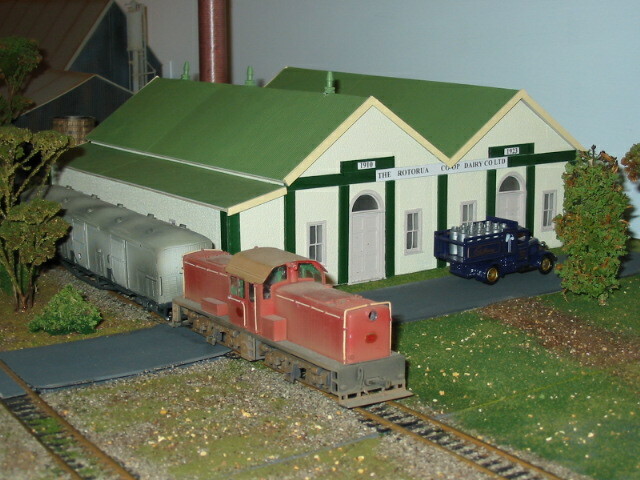 See attachment of the fine representation of the Ngongotaha dairy factory building, constructed by Brett. As for myself. Having completed the construction and delivery of Ab 761 to the Fell museum in Featherston, I have been able to assist (on some days) with the exhibitions in Rotorua and Hamilton. With that motivation I have now started some scenic work on the first 90 degree corner modules. Christmas is only 8 weeks away so don't forget to put your orders into Santa!